Cardiff pond maintenance, Carlsbad pond maintenance, Carmel Valley pond maintenance, Del Mar pond maintenance, Encinitas pond maintenance, La Costa pond maintenance, LaJolla pond maintenance, Leucadia pond maintenance, North County pond maintenance, Point Loma pond maintenance, Poway pond maintenance, Rancho Santa Fe pond maintenance, San Diego pond maintenance, and San Marcos pond Maintenance. North County Ponds and Rancho Santa Fe pond service. North County Ponds 760-710-1632 P.O. Box 8053 Rancho Santa Fe, California 92067. North County Ponds is north San Diego's best pond cleaning and pond maintenance service pond cleaning service. For a clean, healthy, beautiful pond, our pond maintenance is second to none. We are pond service professionals and are passionate about clean, healthy koi ponds. Let North County Ponds care for your koi pond. Keep your pond beautiful! 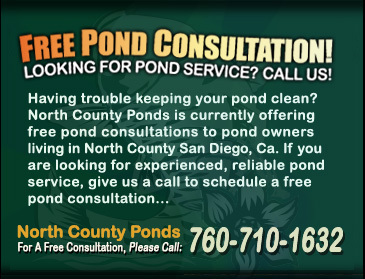 Call us today for a free pond consultation: North County Ponds (760-710-1632) Dirty pond? 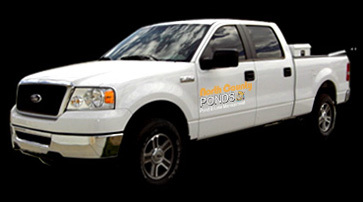 North County Ponds is the answer for clearer, cleaner pond water, pond muck removal, aquatic plant management, pond algae control, pond filter and pond pump maintenance, pond equipment installation, koi health, pond health, and general pond and lake management. North County Ponds services the greater area of north San Diego county including: Rancho Santa Fe ponds, Del Mar ponds, La Jolla ponds, Carmel Valley ponds, Solana Beach ponds, Encinitas ponds, Carlsbad ponds, and Fallbrook ponds. POND CONSULTATIONs: North County Ponds pond service and pond maintenance company is based out of Rancho Santa Fe, California. While a majority of our pond service cliental is located in North County, San Diego, we service ponds all over the San Diego area. If you are serious about the condition of your pond, or are interested in our regular pond maintenance programs, please call our office to schedule a free pond consultation and pond evaluation. Once you schedule a pond consultation, one of our friendly pond maintenance technicians will come out for a pond analysis. 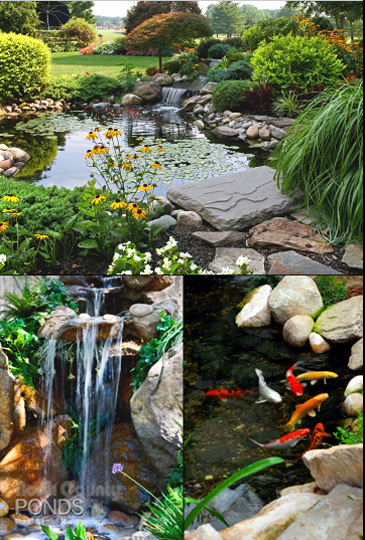 Based on the evaluation of your pond’s condition, your wants, your pond needs, and your pond expectations, our pond maintenance technician will recommend which type of pond service or maintenance program would best suit your koi pond, water garden, or small lake. If your pond is new or old, large or small, North County Ponds is trained in a variety of pond care services including regular pond maintenance, on-call pond services, pond clean-outs, complete filter system installs, pond water treatments, system cleanings, pond sealing, koi medicating, koi and fish care, algae control, aquatic plant care, and all other aspects of pond and lake management. Call North County Ponds at 760-710-1632 for questions, pricing info, or to schedule a free pond consultation.